Daytime temperatures may rise in September, but evenings are still cool. Many trees and perennials suddenly burst into flower, some even before the new leaves appear. It’s an exciting time of year. The birds become active again and their calls fill the air as they busily begin building new nests and choosing mates. It is usually still a little dry as the rains often don’t start until November. Mesembs (vygies) captivate and enchant all. 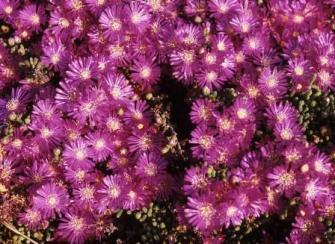 Their brilliant shimmering flowers appear in a variety of colours; red, mauve, pink, orange or white. Scrub hares are particularly partial to these plants and often make a meal of them before they have an opportunity to flower. At this time of year, grey duiker sometimes wander into the cultivated section of the Garden to look for food. They are browsers and feed on leaves, flowers and fruits, but in spring the natural bush is still dry and leafless and food is scarce. The Medicinal Garden is also a pleasure to visit at this time and a variety of bulbs that were hiding underground during the cold winter months suddenly appear in all their brilliance. 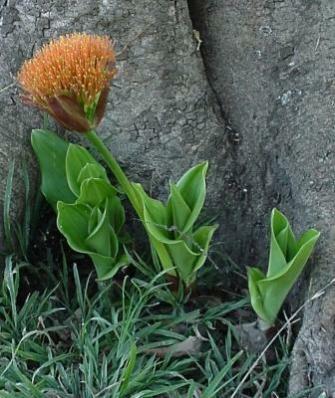 The bright red paintbrush (Scadoxus puniceus) is an excellent example. It is quite special to witness the purple blossoms of the many tree wisterias (Bolusanthus speciosus) that are planted all over the Garden. The lane of Bolusanthustrees planted along the service road that runs parallel to Cussonia Avenue just outside the Garden is spectacular. On the ridge, Ochna pretoriensis (Magalies plane) and Ochna pulchra (peeling plane) become clothed in masses of yellow flowers. Ochna pulchra has an attractive white bark which peels off in flakes. A broad band of clivias (Clivia miniata) lines pathways near the Tea Garden. 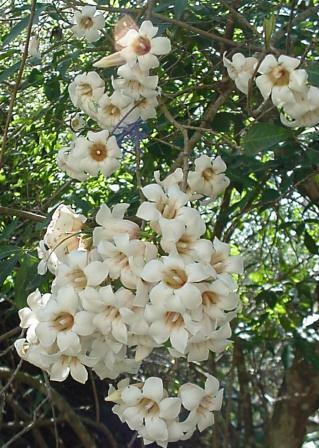 Rothmannia globosa (September bells) is covered in large, scented, creamy white bells and the many acacia trees (thorn trees) are adorned with fluffy, often scented flowers. November to February are our summer months. The average summer temperature is a pleasant 27 – 28ºC. Days can sometimes be very warm and temperatures may reach 36ºC. Rain falls in the summer months, the annual amounts fluctuating from year to year. In years of good rainfall, the Garden is a lush green and a pleasure to visit. 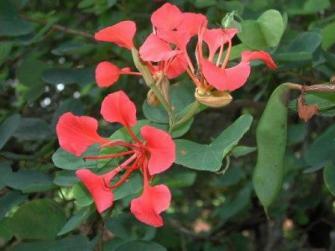 Masses of large, apricot-red flowers of Bauhinia galpinii (pride of De Kaap) line the entrance. 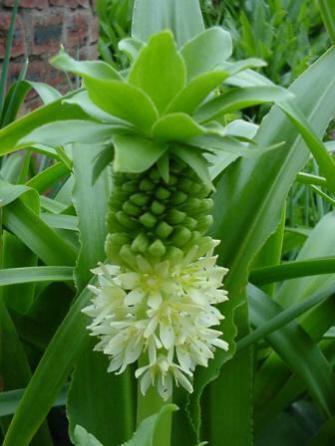 The yellow-green pineapple plant (Eucomis autumnalis) and Crinum bulbispermum (Orange/ Gariep river lily) make a visit to the Medicinal Garden worthwhile. Huge clumps of Helichrysum splendidum(Cape gold), a medium-sized herbaceous plant with attractive silver-grey foliage and masses of deep canary-yellow flowers, have been planted in the beds near the Ndebele huts. The natural grassland in the Garden is another must-see. A large variety of grasses and wildflowers are in bloom and it is a time when visitors can fully appreciate all the treasures of the grassland. A spectacular indigenous creeper Combretum microphyllum (flame creeper) is breathtakingly beautiful when in full bloom during October and November. It is certainly one of our most beautiful creepers with its bright red flowers and dark green foliage. Look out for it in the Succulent Garden. Many trees are in bloom all over the Garden and some trees, such as the fig trees, are in fruit, which is a great attraction for fruit bats at night. Water lilies (Nymphaea) fill the ponds in the wetland and amongst the reeds (Cyperus papyrus), near the Cycad Garden, Thick-Billed Weavers tend their nests and raise their chicks. A stroll along the Dassie Trail is recommended. This self-guided trail wanders along the koppie and allows visitors to experience the type of vegetation natural to the area before people settled here. Dassies are frequently encountered along the trail, scurrying off with loud, high-pitched shrieks. The year begins to wind down and winter approaches again. This is often a very pleasant time of year. The weather is fairly stable and the hot summer days give way to comfortable cooler temperatures during the day and night. Usually little or no rain occurs at this time of year. Many plants only start flowering now and the Garden still looks good. Crocosmia aurea (falling stars) is special in autumn – its long, leaning stalks of bright orange flowers catch the eye. 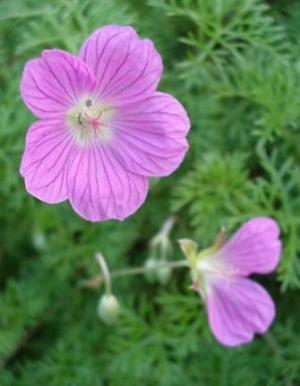 The carpet geranium (Geranium incanum) in the Medicinal Garden is still in flower and provides a spectacular show of dense blue-mauve flowers – a real feast for the eye. Tecoma capensis (Cape honeysuckle) lines the driveway to the National Herbarium and carries large bunches of orange, red, yellow or salmon, tubular flowers. 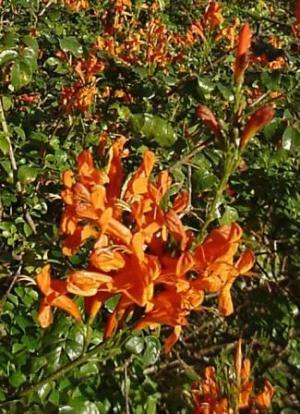 It flowers for a couple of months and attracts sunbirds, who love the nectar the flowers produce. The sunbirds have bright, shimmering metallic colours and are a pleasure to watch. 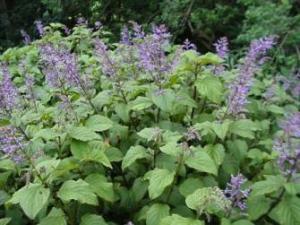 Plectranthus ecklonii (large spurflower bush) and other Plectranthus species are planted in many shady spots in the Garden and spikes of delicate purple, pink or white flowers appear in winter. Plants used in traditional medicines by the Ndebele are cultivated and displayed here for educational purposes. Curving borders of Euryops pectinatus (yellow daisy bush) are in full flower in May. The bright yellow flowers add a last touch of colour to the Garden before winter sets in. The leaves of a few trees take on autumn shades before falling. Do not forget about Strelitzia reginae (crane flower) that starts flowering, displaying its bird-like orange and blue flowers. Early morning winter lawns are often covered in a white, frosty layer. But spikes of brilliant red and yellow or pink aloes brighten dull winter days; their colours subtly mellow and warm the chill. They attract shiny, sparkling sunbirds who sip nectar from their tubular, waxy flowers. 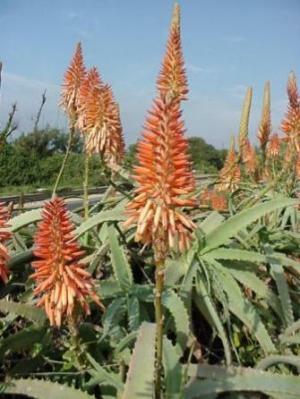 Most aloes and some succulents produce their brightly coloured flowers in winter when virtually nothing else is in bloom. Aloe vanbalenii (Van Balen’s aloe), A. arborescens (krantz aloe), A. cryptopoda, A. ferox (bitter aloe), A. marlothii (mountain aloe) and A. excelsaare just a few examples of the aloes to be seen. The krantz aloe lines the main entrance to the Garden. On very cold winter nights in June and July the temperature may drop to -3ºC. Winter mornings are chilly, but the days soon warm up to an average temperature of about 18ºC. The Garden does not get snow, but may often have frost. A large number of the trees in the Garden lose their leaves in winter, leaving the interesting shapes of the bare branches etched against the sky. 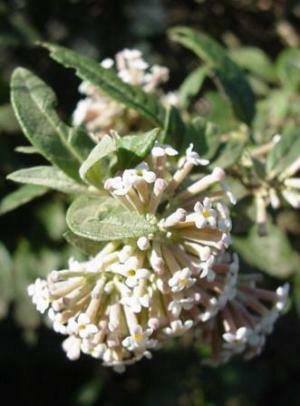 A very attractive large scrub, Buddleja auriculata (weeping sage) boasts masses of sweetly scented cream, light orange to lilac flowers. 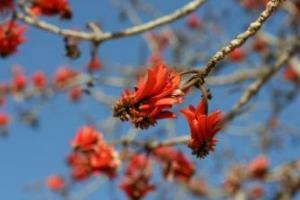 Towards the end of winter in late August, Erythrina lysistemon (coral tree), Dombeya rotundifolia (bushveld bride) and Buddleja auriculata (weeping sage) may start to flower giving the first hint of spring! The striking, deep-red flowers of the coral tree and the sweetly-scented, creamy white blossoms of the bushveld bride stand proud above the leafless vegetation.